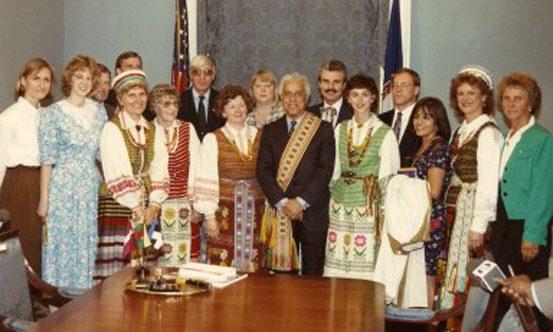 This photo depicts Springfield Lithuanian activism during the “Singing Revolution.” It marks the May 1991 public signing of a declaration of “Baltic Freedom Day” in the state of Virginia by (center, in honorary juosta sash) then-Virginia Gov. Douglas Wilder, at the request of the Lithuanian-American Association of Richmond (Va.). Terry Baksys, second from left, born and raised in Springfield, is a long-time resident of Richmond, Va. who was a dedicated independence activist with the group. Baltic Freedom Day in Virginia was set for June 1991, marking the 50th anniversary of the mass Soviet deportations from Lithuania, Latvia and Estonia that began just before the German invasion of the Baltics in June 1941. Gov. Wilder, who was the first-ever African-American U.S. governor, had a national profile, which was one reason why Terry and her group thought he would be receptive to their idea. However, some quick action by Terry was necessary when the governor’s press secretary initially resisted a public signing ceremony for press due to unrelated political considerations. Terry called the late Jay Shropshire, Gov. Wilder’s chief of staff, informing him about the resistance from the governor’s press secretary to having media at the signing ceremony. She said that would ruin the whole point of the day, which was to get Lithuania’s cause before the public. Lobbying with the public through media on Lithuania’s behalf was the soul of U.S. Baltic activism in support of the “Singing Revolution.” Everyone agreed that global public opinion was the only way Lithuanians abroad could try to stop the Soviet tanks from rolling over our countrymen and their non-violent movement. Shropshire, who knew both Terry and her husband, Bill, said he would talk to the Governor about it, and shortly thereafter, word came that Gov. Wilder would stage a public ceremony, with the press included, to sign the proclamation. Signing day was a big event. Many members of the Richmond group crowded into the Governor’s conference room on the third floor of Virginia’s executive mansion. Word had spread among the Baltic community, even in D.C., and representatives of all three Baltic nations were present as Wilder signed the proclamation with the cameras rolling from three local TV stations and the Richmond (Va.) Times-Disptach also in attendance. You might be able to make out a hand holding a “Channel 8” mike in the lower right-hand corner. TV-8 is Richmond’s ABC affiliate. The Governor was presented with his “juosta” or sash, as well as several books, including one on the January 1991 massacre at the Vilnius TV tower, and a set of three Baltic flags, by the Richmond Lithuanian group. At the far left in the photo is Daiva Bobelis, a student at the Medical College of Virginia. Laima Ghattak, president of the group, is standing just to Gov. Wilder’s left. Several representatives of the Baltic consulates in D.C. and other Baltic groups also attended. The tall man with the gray hair and dark glasses is Joe Arlauskas, who published the Lithuanian-American Community’s “Bridges” magazine. Virtually hidden over on the left side of the picture are two gentlement from the Washington Lithuanian community, Peter Kaufmanas (the shorter of the two) and Victor Nakas, who was very active in the Baltic independence movement and an aide to Ambassador Lozoraitis of the Republic of Lithuania. The Lithuanian Embassy to the U.S in Washington had never been closed or permitted by the U.S. government to be taken over by the Soviets, since the U.S. never recognized Lithuania’s annexation by the U.S.S.R., so Mr. Lozoraitis had been at the Embassy since World War II. Arlauskas was the main speaker. After the ceremony, the Richmond Lithuanian group gave its signed proclamation to Mr. Lozoraitis, and we assume it is still in the Lithuanian Embassy in Washington today.